Turn five at Estoril circuit isn't really a turn at all, but a right-hand kink. 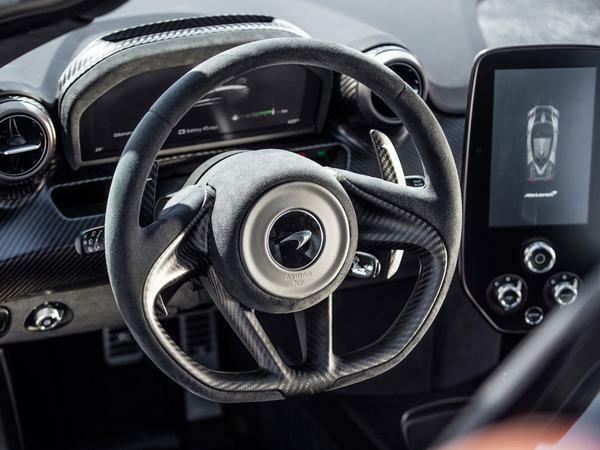 In a McLaren Senna, with a professional racing driver at the wheel, it must be easy flat in fifth gear. For the rest of us, though, it takes some building up to. You arrive at the kink far sooner than you thought you would - 800hp has a habit of shrinking distances, especially when it's working against not much more than 1,300kg - which means you feel one step behind even before you've turned in. You keep hard left, short shift into fifth, spot your early turn in point and aim the car's unpretty snout at the kerb on the apex. You beg and plead with your right foot to stay at full extension but yet again, as though compelled by some external force, it blinks and retreats an inch. Next lap, you say to yourself. Next lap. At no point during that four or five second passage of play did you have even an instant to worry about the Senna's unapologetically functional styling, nor its breathtaking price tag. Across the duration of a six-lap stint, in fact, you have only the time and spare metal capacity for two thoughts. The first is that you absolutely must get over yourself and stick this blasted thing through that turn five kink flat-out before your session is over. Your pride is on the line. 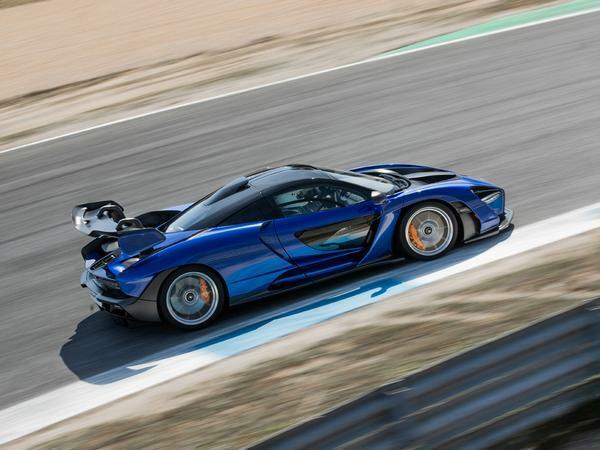 The second is that the McLaren Senna is surely the single most astonishing road-legal car you have ever driven on circuit. What you need to know about McLaren's latest Ultimate Series car is that, problematic though its styling and proportions undoubtedly are in pictures, it is way more convincing in person. Especially in the pit lane of Estoril circuit. A very long way from beautiful, but purposeful, like a fighter jet. 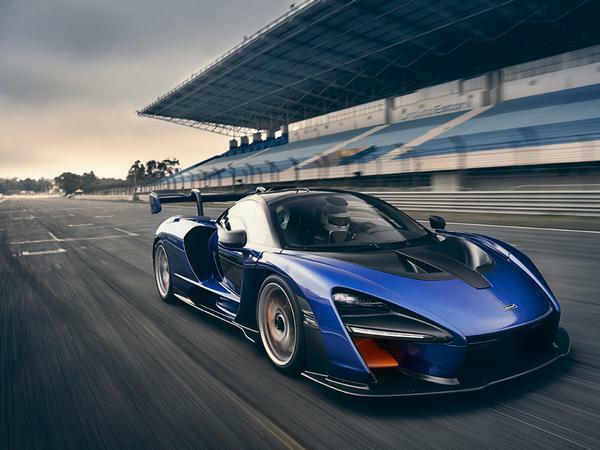 The Senna costs £750,000 before options, for which you could buy a 720S, and a 570GT, and a 570S Spider, and a 540C, and a six-year-old MP4-12C, or just do an awful lot of racing, but that somehow doesn't seem to be a factor when you're driving the car as quickly as you dare. 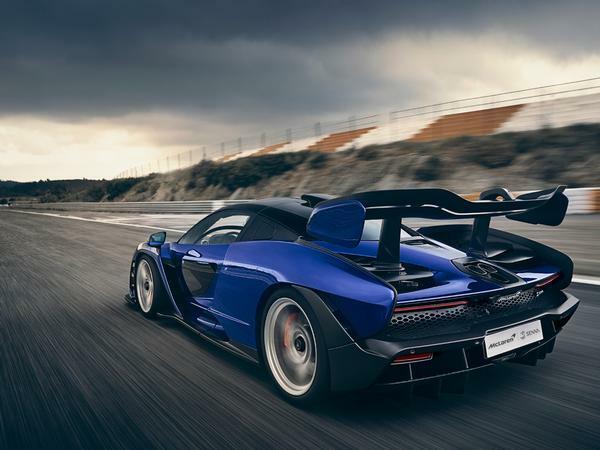 The point is, whatever misgivings you may have about the McLaren Senna, they will probably not withstand the persuasive power of a couple of six-lap stints behind the wheel. Why Estoril? This is where Ayrton Senna graduated from promising young thing to Grand Prix winner, 33 years ago. In sodden conditions, the 25-year-old masterfully wrestled his Formula 1 car around 67 laps of this fiddly circuit on the outskirts of Lisbon to clinch his first win, beating second-placed man Michele Alboreto by more than a minute and teasing the preternatural talent that would eventually carry him to three Formula 1 World Championships. 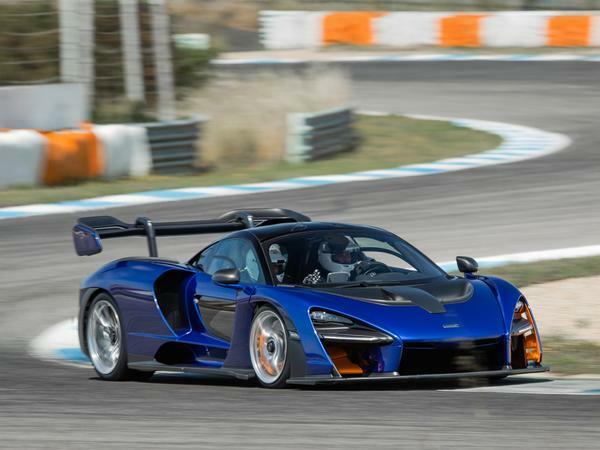 A McLaren Senna and the very circuit where the man himself took his maiden F1 win? It could hardly be more perfect, except for the slightly inconvenient fact that the Brazilian happened to be driving a Lotus at the time. 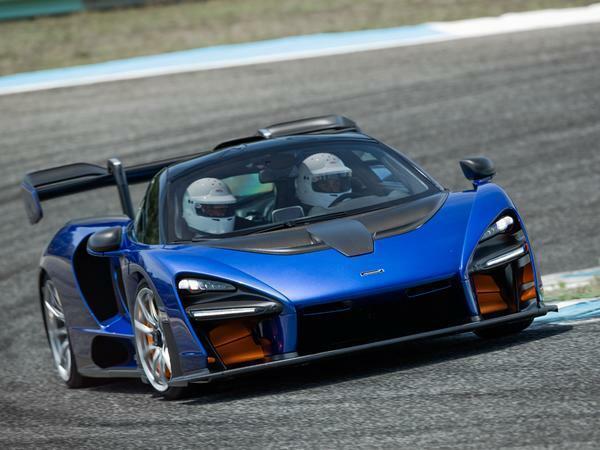 As you know, PH has already had a taste of the Senna. Matt Bird drove what was described as a prototype for a handful of laps at Silverstone a couple of months ago, but this is hardly the sort of car you drive once and call it a job well jobbed. So here we are, in the Estoril pitlane - which is flooded in early summer sunshine, thank the lord - a fleet of extravagantly winged and vented hypercars lined up, looking like the first wave of some sort of terrifying military offensive. 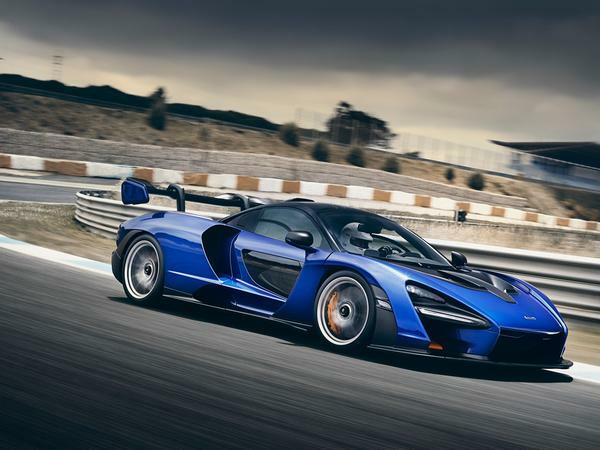 The whole procedure around driving a McLaren Senna, particularly on an official McLaren event, is so self-consciously motorsport that your expectations are ratcheted up a level or two. You sign waivers, lift your race suit, boots and fireproof underwear - wait, what? 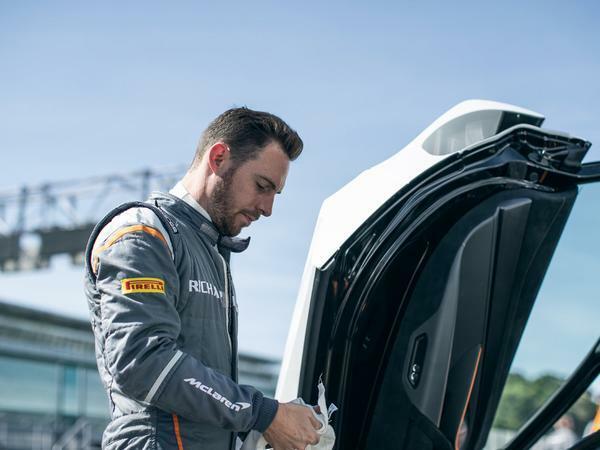 - out of a locker that's got your name on it, then take a helmet and HANS device from a nearby shelf and meet your instructor who is, of course, a racing driver. Then you walk out of the pit garage and towards your car, which invariably has a small team of McLaren personnel milling around it, all of them in corporate clothing. So is this qualifying, fellas, or are we straight into the race? I suppose it's all designed to heighten the experience. To make you feel as though you're part of something special. Which you are, of course. What it really does, however, is make you sick with nerves. 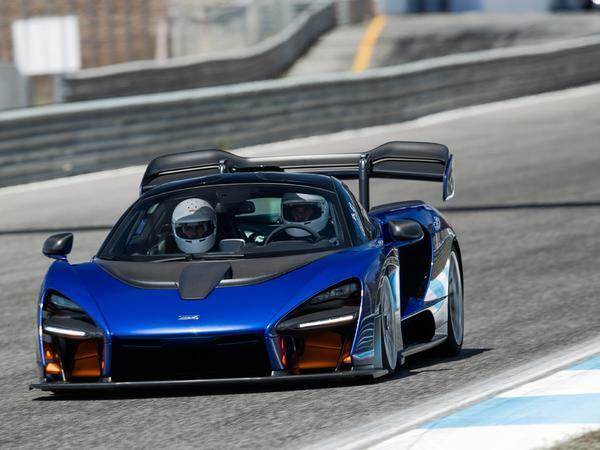 Shunting a McLaren Senna, at this bloody circuit of all places, is exactly the sort of thing that propels a person to overnight internet stardumb. Thing is, it'd be a heck of a shame to not give it your best shot. 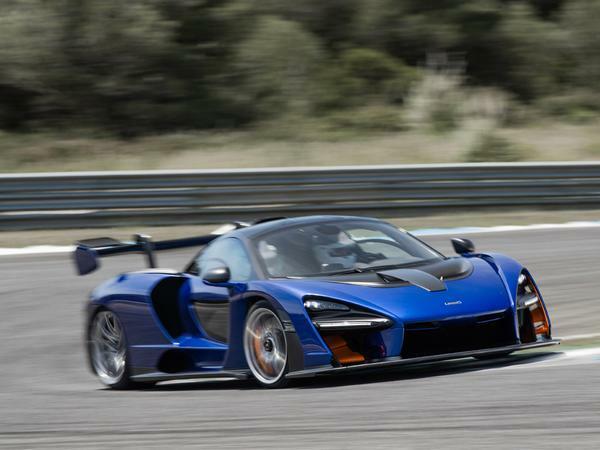 You'll probably never get anywhere near a Senna again, after all. So you lower yourself in, pull the harnesses tight, slam the door shut and, well, gulp. You'll have read all about the Senna's technical specification before, but there are certain points that are worth revisiting. McLaren says this is its lightest, fastest and most engaging road-legal car on circuit so far. It has active aerodynamics, which constantly tweaks the vanes at the front end, as well as that enormous rear wing, to best manage the air flow depending on whether you're cornering, braking, or flying along a straight. 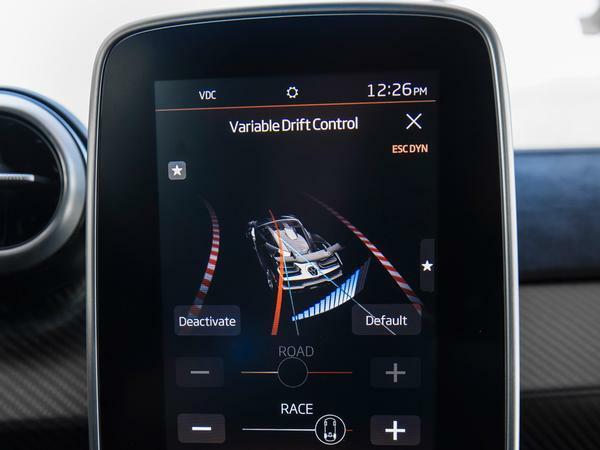 There's also Race Active Chassis Control with McLaren's trick interconnected hydraulic dampers, which can drop the car by as much as 50mm once it's rolling along at speed in Race mode and massively increase effective spring rate, all of which makes it much less of a road car and more of a thoroughbred racer. 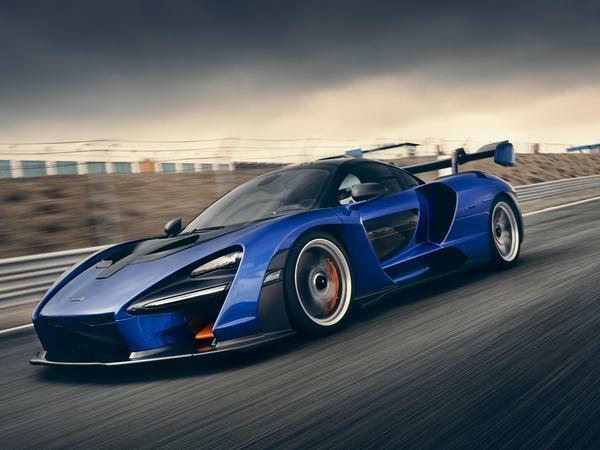 There is no electrical assistance for the 4.0-litre twin-turbo V8 engine - with no hybrid system to lug around the Senna is close to 200kg lighter than its long since retired Ultimate Series stablemate, the P1 - which develops 800hp and 590lb ft. You can think of the Senna as a downforce car. 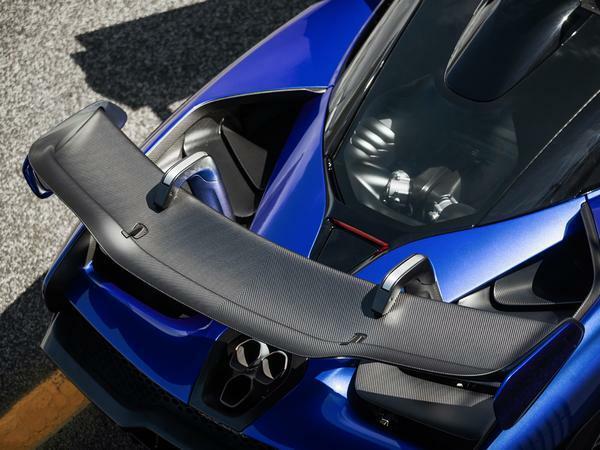 It generates up to 800kg of the stuff, 500kg of which is created by the rear wing alone (that vast trestle table wing, by the way, weighs less than 5kg). Let me give you two performance stats. 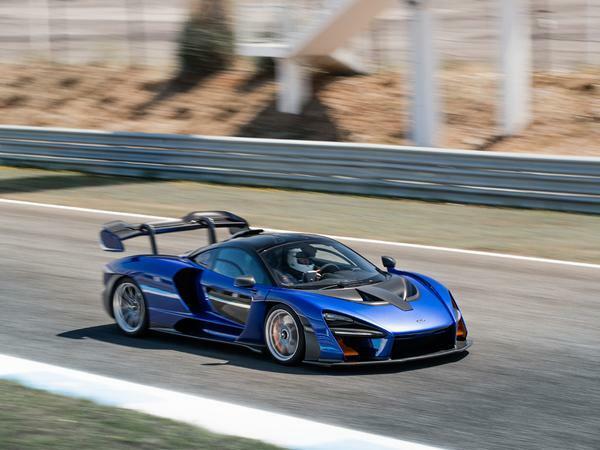 The Senna will cover the standing quarter mile in 9.9 seconds. 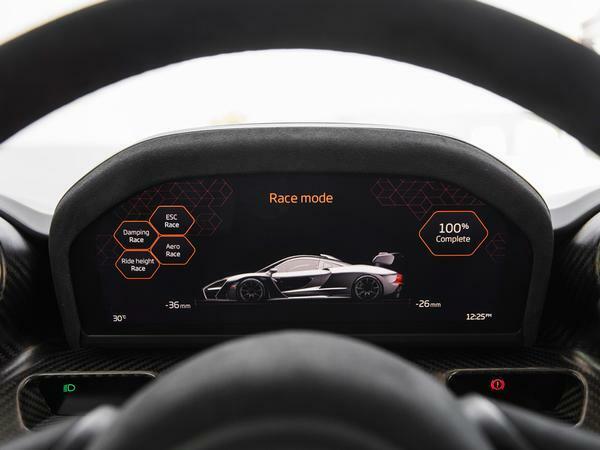 It will also brake to a standstill from 124mph in 100 metres, whereas the P1 requires 116 metres. Actually, I have one more stat for you. 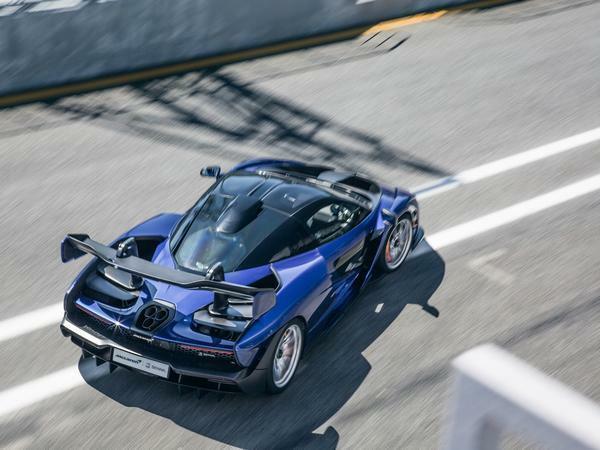 Rumour has it the Senna, on its road-legal Pirelli P Zero Trofeo R tyres, is less than two seconds a lap slower around Estoril than McLaren's slick-shod GT3 racing car. Maybe that motorsport-style build-up wasn't merely theatre; it was absolutely necessary. By now, then, you're pretty much convinced that what you're about to drive is a full blown racing car. That's why, when you feel the front end pushing on quite noticeably in third gear corners, even when the tyres are warm, you feel a slight sense of...not disappointment, but moderate surprise. With your full face helmet and motor racing finery on, your racing driver buddy sat next to you and the harness pulled tight you expect grip levels beyond the likes of which you've ever experienced before. But of course the car understeers a little on track. Those Trofeo R tyres - which, by the way, are said to have come on leaps and bounds since the P1's day - are not racing slicks. They're designed to clear at least some water should it rain, and they're road legal, for heaven's sake. So there is some push. Thing is, it's only in those medium speed corners that the tyres are any sort of limiting factor. From third gear onwards, while exiting a bend, they simply hook up and take whatever throttle you dare throw at them, and under heavy braking it isn't tyre grip that determines your stopping distance, or even the strength of those enormous brakes, but the effort you can generate with your leg. Once you've reminded yourself the Senna is actually not a competition car, it all starts to come together. 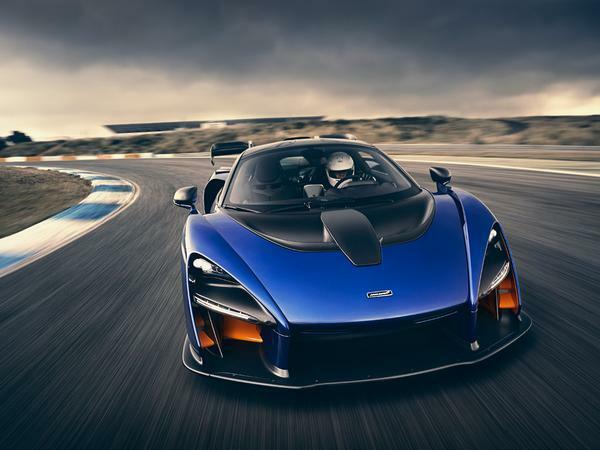 There is no way a machine with this sort of performance and that kind of price tag can be anything other than intimidating, but in reality the Senna is very approachable. Within a couple of laps, then, you start to push it a little harder. You know you're getting somewhere with the Senna when you start releasing it into fourth gear bends, allowing it to roll on when all your prior experience of fast road cars on circuit says you should really keep the brake pedal buried for a few more metres. So you let it go and trust the front end grip. Apart from that flat-out-if-you-dare fifth-gear kink, there are only really two fast corners at Estoril, both of them right handers, both taken in fourth. With the aerodynamic devices doing their thing and the tyres biting hard, the suspension soaking up the big apex kerb you've just clattered without any fuss, the Senna is completely astonishing in those corners. Once again you have to remind yourself this is a road car, but only - this time - because you can hardly bloody believe it. What else? You'll never notice those glass panels in the doors while driving on track. You just don't look down there. The Senna is a relatively easy car to drive quickly, but to drive it really quickly would take a huge amount of coaching and seat time. 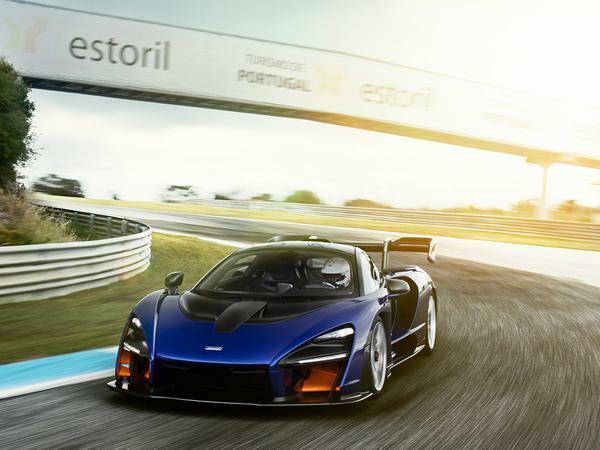 That would ultimately be massively rewarding, certainly, and that's exactly what Senna buyers are signing up for (well, those who actually intend to drive their cars, anyway). 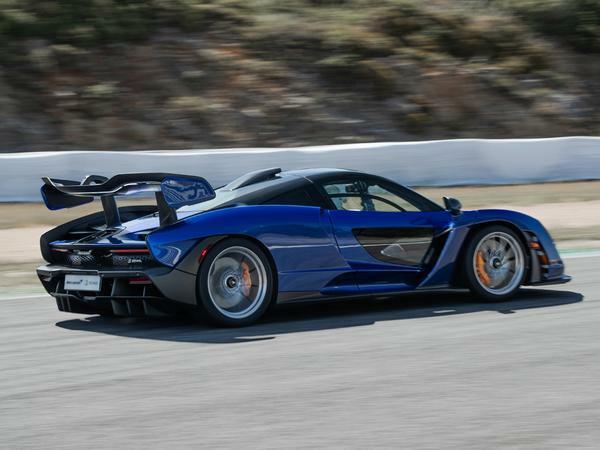 The lasting impression, though, is that the McLaren Senna plays fast and loose with the line that separates racing cars from mere road cars like nothing else before it. Dare I say it? It's a whole new thing. It's a good write up. It puts you in the car and is a compelling read. Bravo! Hard not to agree. The quality of the editing here is nearly as bad as the laughably compressed thumbnail sized pictures. Indeed. I’ve no idea what “spare metal capacity” is, in relation to this car. Ummm... can i say it doesnt look awful in these pics without having to close my account on here? "Internet stardumb" is my favourite. Oh and please never, ever use "trick".